Publication: October 17th 2013 by HiJiks Ink Publishing Ltd.. Numbers are everywhere—they play such a vital role in our everyday lives. But what would happen if we measured love with equations just as we do our morning cup of coffee? My nana had many recipes in her cupboards, but it was her calculations for love that she insisted I live my life by; and I’ve followed her rules all these years. That’s all it took for the numbers to start flying in a jumbled mess through my brain as I stared into the violet eyes that would forever make me question my choices. In a split second, the possibilities and reality of true love are revealed and I’m questioning all I’ve ever known. I can’t ignore the storm brewing around—and within—me. Everything I am is confronted by these new numbers, and all they represent. My past, present and future will all be determined by the gambles I make right here, right now. Again, it’s all about the numbers. I’m the guy Brielle met by accident. I can’t tell you my name, I can’t even tell you how we met, except that if I did, I would ruin the story for you. And you don’t want that. The thing is, from the second I met Brielle, I knew that she was the one I’d been waiting for my whole life. The one that every beat of my heart existed for. Corny, cheesy, I know, but that doesn’t change the fact that it’s the truth. For me to meet her when I did though, was a twist of fate that makes me wonder what I’ve done to deserve this kind of punishment. To show me where I belong only to deny me being at her side. She’s beautiful, in a girl next door kind of way, down to earth with everything she does. But even without that, I would still love her. I love her knowing that I can never be with her, not unless something drastic changes. Yet I’m not sure that anything ever will change, not without destroying the lives of too many people. So I will take what I can, a simple friendship that will barely be enough. Because every time I see her, my will power crumbles a little more, and I’m afraid that at some point, I won’t be able to say no to her. This event is a web crawl scavenger hunt and you are ALL invited! Each day, different blogs will have different events for you to crawl around the web and enter the hunt. GRAND PRIZE: IPAD MINI or $350 Amazon Gift Card (all Amazon territories included) winners choice. To participate in today's web crawl events, follow the directions below to receive your daily points. Once you have completed one of the 2-3 daily events, please return to Shannon’s website at http://www.shannonmayer.com/crawl-between-the-sheets-2013/ and enter your submissions in the Rafflecopter found there! • Find out what was one of the bravest things she’s ever done. Submit your answer as your entry at http://www.shannonmayer.com/crawl-between-the-sheets-2013/ . ON FACEBOOK: Go to Liliana Hart’s Facebook Page at: https://www.facebook.com/lilianahartauthor? Submit the link to your post as your entry at http://www.shannonmayer.com/crawl-between-the-sheets-2013/ . Submit the email address you signed up with as your entry at http://www.shannonmayer.com/crawl-between-the-sheets-2013/ . To see other blogs and the rest of the week’s events, visit Shannon’s site and check out her News Blog! Shannon Mayer lives in the southwestern tip of Canada with her husband, dog, cats, horse, and cows. When not writing she spends her time staring at immense amounts of rain, herding old people (similar to herding cats) and attempting to stay out of trouble. Especially that last is difficult for her. She is the author of the The Rylee Adamson Novels, The Nevermore Trilogy, A Celtic Legacy series and several contemporary romances. 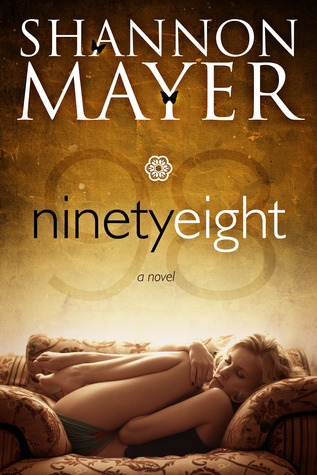 For a limited time, Ninety Eight will be priced at JUST $0.99! Shannon’s other contemporary romance, High Risk Love, has also been reduced to $0.99 during the release event for Ninety Eight! I know I bought me one! I love reading new adult and this one sounds great! This is Lysa, Shannon Mayer's Assistant. I wanted to take a moment to thank you for being a part of the Release Event and Crawl Between the Sheets 2013 for Shannon’s newest Contemporary Romance, “Ninety Eight”. I am sending you a private message with a great offer, so please check your email!